Thought I'd write up a quick revival project I've done as a first foray into actual tinkering. I bought what was advertised on eBay as a 7A38-7278 - as Paul rightly pointed out, it was a -727B. £46 felt like a decent price really, although it came without a bracelet and with a scratched crystal and flat battery. What better opportunity to try out some of the practices so widely used by experienced owners? So off I went to Amazon and procured some tools and a glass press. 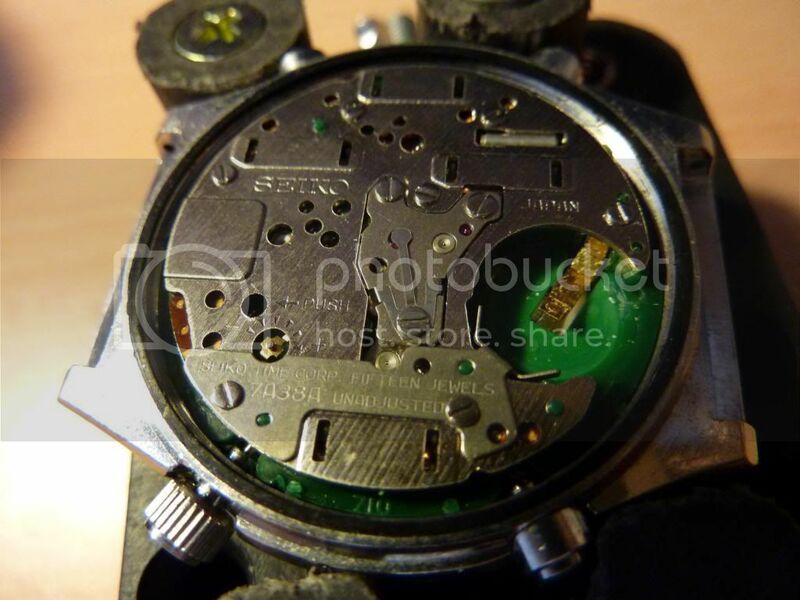 I was worried about the alignment of the sweeper hand and chrono dials - presumably the battery had died right in the middle of timing something, or the usual realignment procedure (pull crown out to first stop and use the pushers) hadn't been performed. So - do we have a replacement dial here, or a replacement case back? I thought the -7230 was a white-on-white dial, whereas this is obviously white-on-'off-white'. 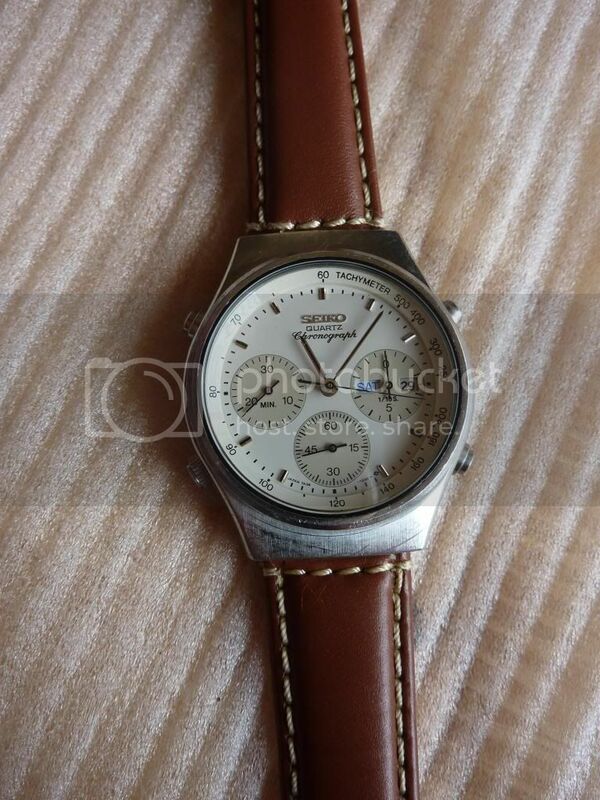 Anyway - I finished the rest off and put it on an 18mm brown leather strap - I think it looks pretty good! The only thing wrong now is bigger than I think I can deal with. The chrono function works in that it starts, stops and resets - except the 9 o clock dial doesn't register minutes passing at all, or does it reset when the 4 o clock pusher is pressed. Also, the sweeper hand resets to 17 minutes past. No biggie, I think - you can just realign the hands with the crown pulled out to the first stop. So I try - and the day/date can change so I know it's pulled out - but none of the hands can be adjusted on this setting and the start/stop/reset work as usual rather than adjusting dials. 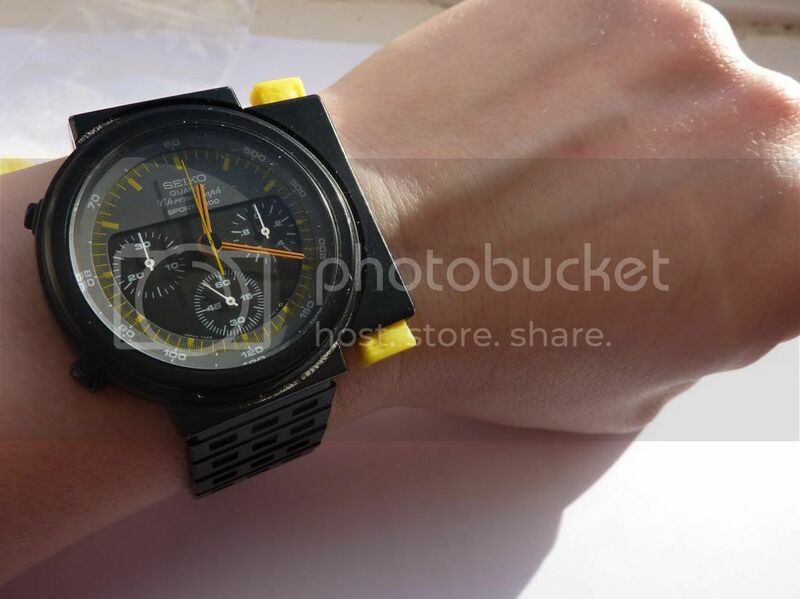 Rather than blaming the eBay vendor (despite the watch arriving with all the chrono hands out of kilter), I can't help but think it might be something to do with the crown replacement. Does anyone have any experience or ideas on this? Well done so far, Mark - and nicely embedded links - a man after my own heart. .... but none of the hands can be adjusted on this setting and the start/stop/reset work as usual rather than adjusting dials. is very likely down to a bent switch setting lever, as I encountered (and missed myself first time) in this thread. I think I may have written about it seperately in another thread. Edit: Yes I did, here in this other thread. .... except the 9 o clock dial doesn't register minutes passing at all, or does it reset when the 4 o clock pusher is pressed. (apart from the above, which you need to sort first), may simply be down to a duff coil or dirty actuator switch lever contacts. 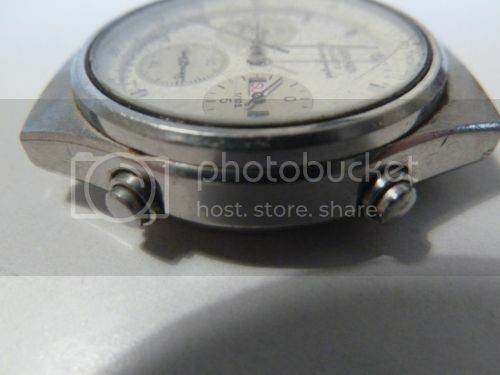 That 7A38 - 7230 R dial is perfectly correct for the 7A38-723B. The full dial part numbers aren't printed on the dial. 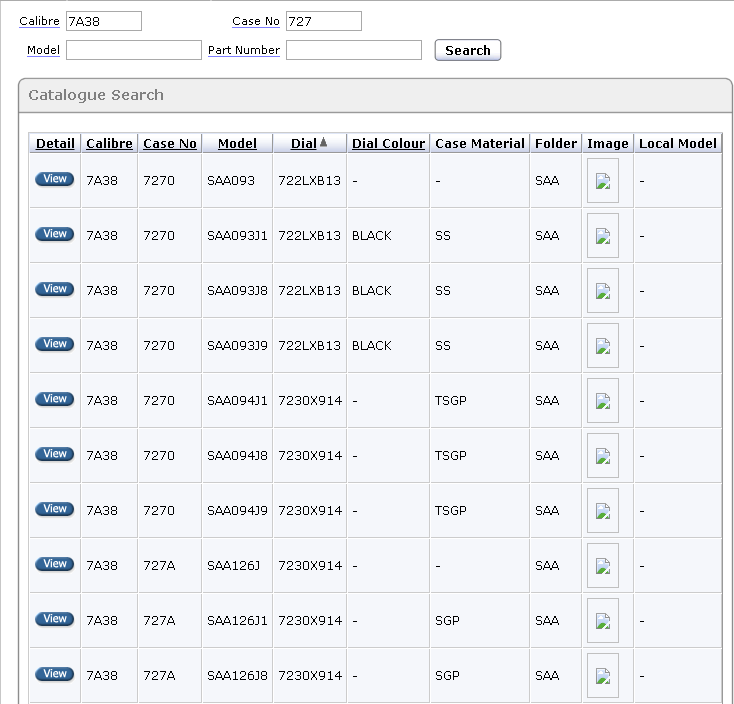 That's actually a p/n 7230X923 in full. 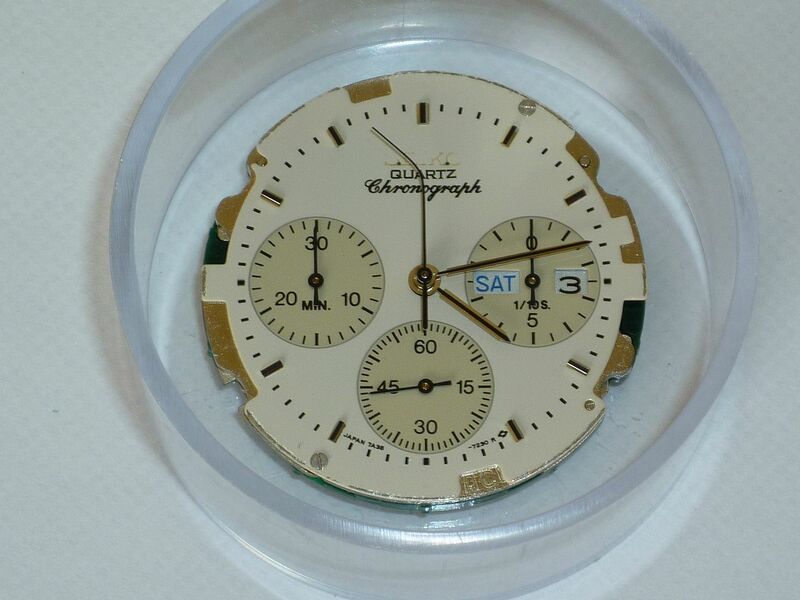 But there are 3 other non-lume 7A38-727x dials besides - all which have (only) 723O printed on them: 7230XN14 (light grey used on the two-tone 7A38-727A); 7230X914 (cream with gold batons used on the gold-tone 7A38-727A and two-tone 7A38-7270) and 7230XG14 (gold with white sub-dial rings used on the gold-tone 7A38-7270). Confused ? You will be - till you get your head around the idiosyncracies Seiko's part numbering ! PS - You reminded me of the only time I've ever fumbled a 7A38 movement. And you think you have problems with hand alignment ! Oooh, yeah, that's a fumble alright! So - I removed the case back, and this time went in search of the lever detailed above. Removed the battery terminal and back plate, plus the circuit layer is well, and found the lever easily enough. Huzzah! It had been compressed down as you thought, so I gently teased it back up to the right level. As I was preparing to pop the circuit layer back on, I nudged the movement and the gold regulator (which sits next to the lever) popped off and disappeared somewhere on the table. It took 5 heartstopping minutes to find it, but then I had to work out how on earth it goes back on. With no reference as to what position it should be in, I made a best guess based on the pictures above, crossed my fingers, and then promptly uncrossed them to put the movement back together. I somehow dropped one of the tiny screws on the floor and it's disappeared, so I'm hoping they're not critical to operation. Anyway - all back together (minus a screw), and it's kind of worked. The 1/10s hand can now be adjusted with the crown out to the first click - good start. However, neither the sweeper hand nor the minute counter can be adjusted, and just to rub it in the sweeper hand now doesn't move at all when using the chrono function as normal. Well actually that was a very lucky save, Mark. I fumbled it as I was withdrawing the crown and stem with the movement held between my fingers and depressing the stem release lever with the point of a needle at the same time. The movement dropped about a foot onto the worktop and rolled over the edge. But with an amazing reaction, I caught it before it hit the floor - resulting in that bent sweep second hand, which I couldn't straighten. 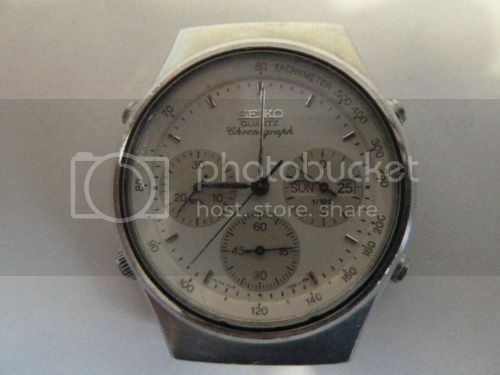 Later I replaced it, along with the dial logo which had fallen off previously. Fortunately, there's seemingly nothing this forum hasn't seen before .... Pretty much True Dat. I somehow dropped one of the tiny screws on the floor and it's disappeared, so I'm hoping they're not critical to operation. .... is largely incorrect. That's probably why you now have another functionality problem - viz. 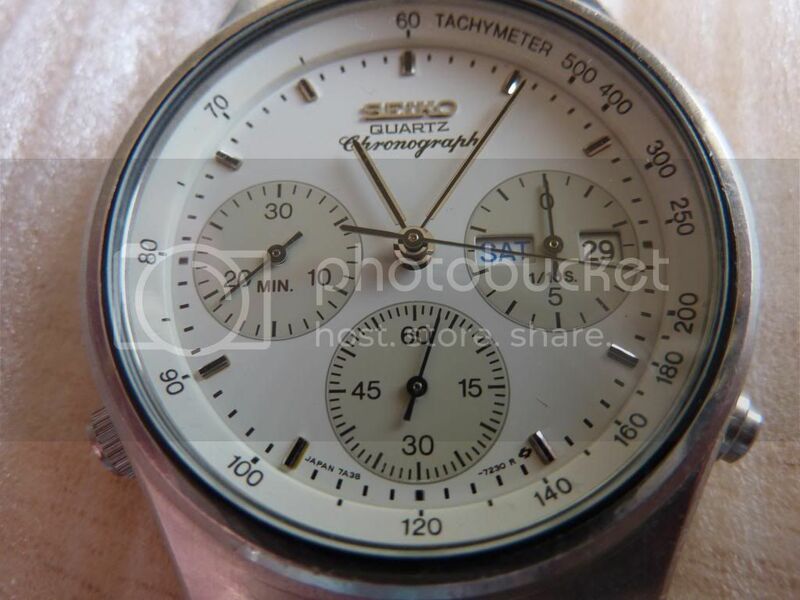 the chronograph sweep second hand. 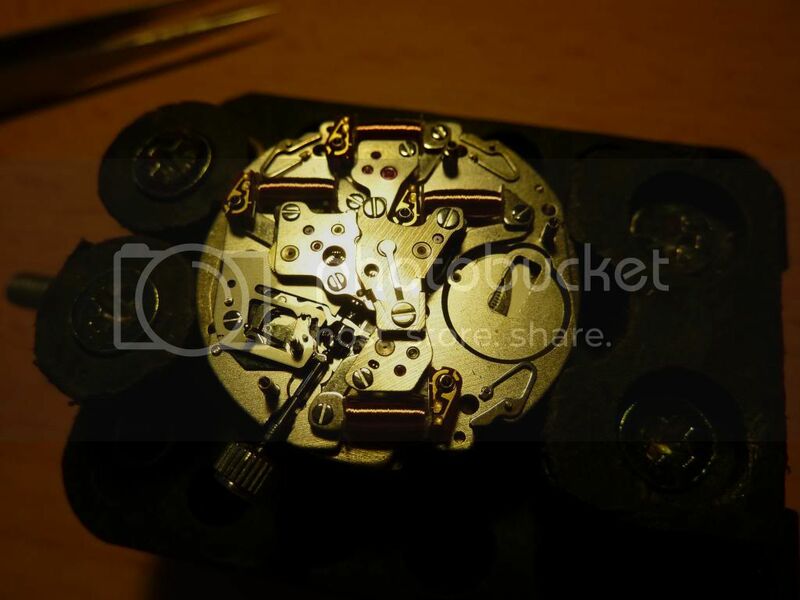 The electrical circuits of the 7Axx movement are completed by earthing through the anti-magnetic back-plate. I've found (on a few 7Axx's I've bought like that) that even one of those screws being loose can cause a partial loss of functionality. Tighten it - fixed. So your having re-assembled the movement with one screw missing altogether (depending which one it is) is the very likely cause. There's an explanation of how it works further down the page of this thread. So you could either experiment swapping screws around until you possibly regain full functionality, or better still get grovelling on your hands and knees to find and replace the missing screw. Although you can't see any of them, I've arrowed (red) the positions where the three chrono' pushers act on the switch lever actuators. I've also ringed the 7 cheese head screws that you need remove to start stripping the movement. Pretty basic stuff this. Those 7 screws go right through to the base-plate: 4 of them form the fixing points for the coil blocks and the other 3 fix battery connections. It goes without saying that if you've bought a watch where any (or all) function(s) aren't working, the first thing you do is check the tightness of these screws. They don't need to be murder tight, but if left loose, they may not complete the circuit. I must have bought half a dozen 7A38's variously described as non-runners / partially non-functional, where all it took was half a turn of a screwdriver. Is a cop-out of the lowest order. As I was preparing to pop the circuit layer back on, I nudged the movement and the gold regulator (which sits next to the lever) popped off and disappeared somewhere on the table. It took 5 heartstopping minutes to find it, but then I had to work out how on earth it goes back on. With no reference as to what position it should be in, I made a best guess based on the pictures above, crossed my fingers. We've even got a short thread on that subject ! I suspect that the screw thread you've currently left vacant is the centre one - hence no chronograph sweep second function. If you can't find the missing screw, try removing the top right or bottom left screw and using that. You may get away with it. 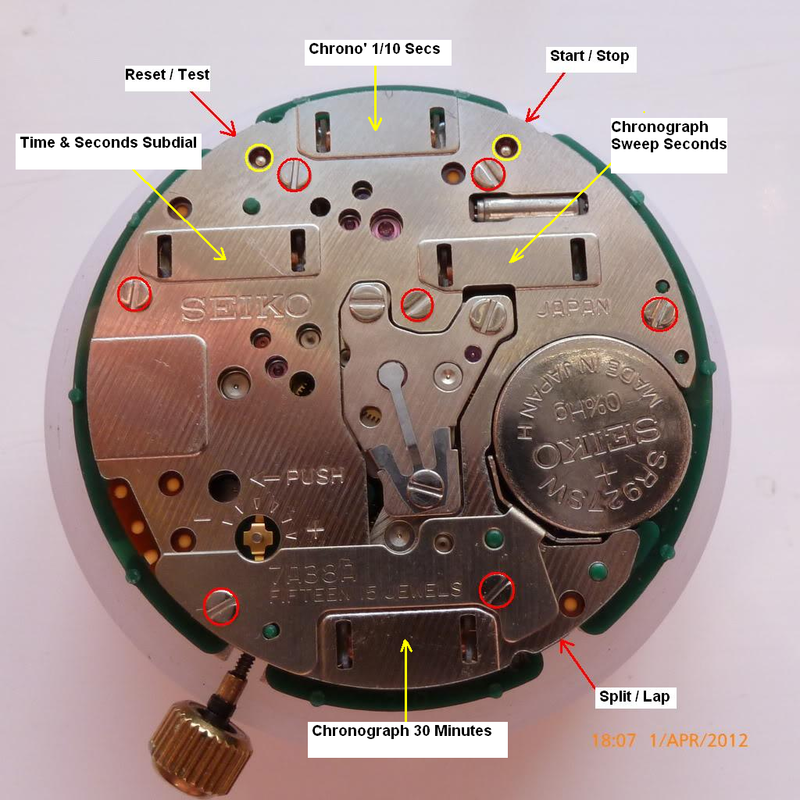 Well, I'd suspected that your watch may have been suffering from a duff 30-minute counting coil (or stepper rotor) from the outset. But have you actually removed the green plastic '710' spacer and checked the condition of the switch lever actuators and the cleanlinesss of the small contact posts embedded in the moulding yet ? You can lift this off without first removing the coils, but you need to be very careful to lift it off squarely so as not to snag them. 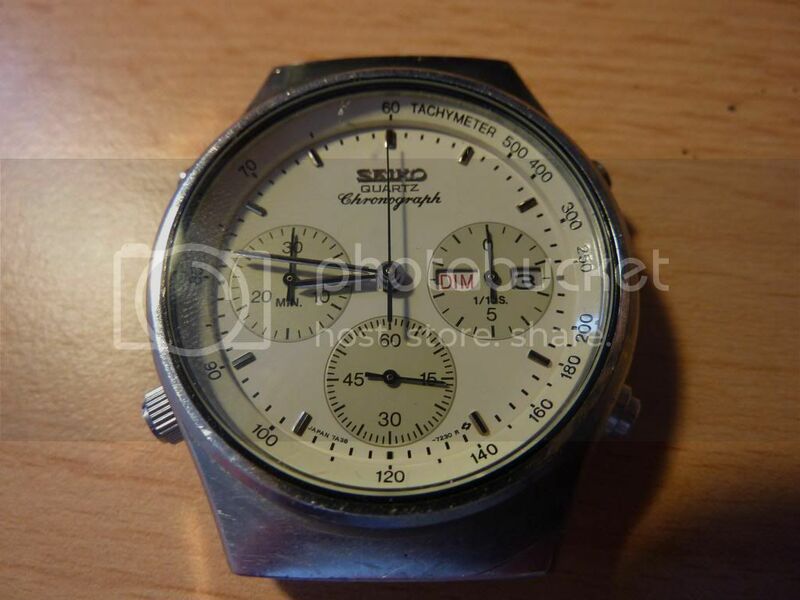 Which is how you may have inadvertently killed the previously partially working chrono' sweep second hand. Hi Paul - thanks as always for the good advice! Checking/replacing coils is more than I think I'm safely capable of and there's every chance I may have disturbed that top one while removing the other bits. I've mentioned thick wrists in previous posts - well, when it comes to fine dexterity, I have hands like those mechanical grabbers the stroke cuddly toys in fairground machines. I'm guessing the first time is always the hardest, right? You'll be delighted to know that I'd read the posts about the finger tension spring for the sweep hand, and it was (and is) perfectly aligned. Well as you've probably gathered from my comment in that thread, that poor unfortunate was severely ripped off by Premier Watches - the outrageous price of £39 invoiced for a replacement crystal being an indication of the profit margins. 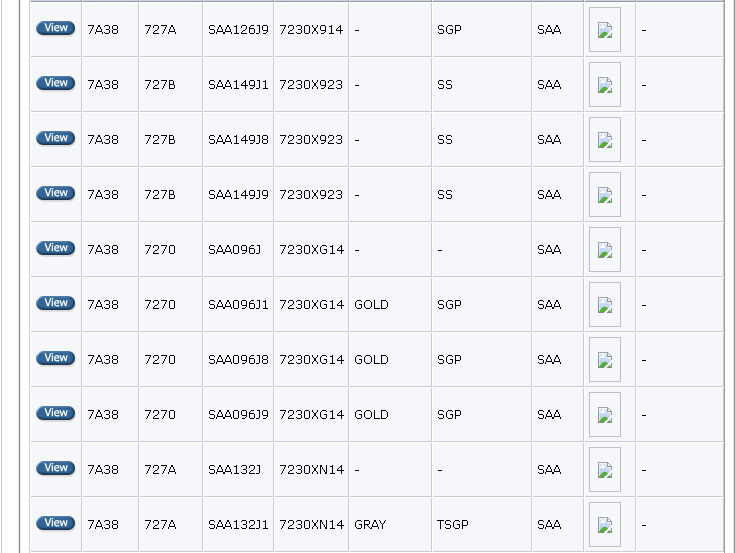 Without checking old invoices, I seem to remember paying Cousins UK £5.95 + VAT for NOS coils. But that was a while back. Nowadays I tend to rob them from scrap movements. I just checked and they're still available from Cousins: Coil A, Seiko p/n 4002.725 is £6.71 + VAT (currently out of stock) and Coil B, 4002.726 is now increased to £12.20 + VAT - but still a long way short of £59. I could of course offer to have a look at it for you myself, but that would kinda defeat the object. I assume you bought this 7A38 to tinker with. You won't learn by my fixing it for you. May I make a suggestion ? You may be suffering from 'fat fingers' syndrome, but don't you have a potential willing assistant in the form of the future Missus Dubya ? Presumably she has more delicate appendages. Getting her involved may increase her interest. - Properly laughed at that! I think I have to resign myself to knowing my limits - and future Mrs Dubya is rather frightened of trying this kind of thing out for herself, especially the removal and replacement of tiny electronic bits. In my line of work (people and talent consulting) we have a well-proven model that shows that great leaders know when to seek external support. I'm leading by example, clearly, by very discreetly waving a little white flag and surrendering to greater technical competence than my own. OK, I relent - you've talked me into trying this one out. God knows it'll be interesting... and I'll document the whole travesty for posterity as well. Watch this space! Thanks garacs1, yes I'll definitely document the butchery resurrection of this one. Coils are now on order so there's no going back. I think reassembly's fairly straightforward, you're right - but I'm the kind of guy that'll do it, and then find a random screw/metal widget lying on the table. Fortunately this site's a treasure trove for little tips, so hopefully I'm as equipped as I can be! I echo Georges suggestions re. photos. 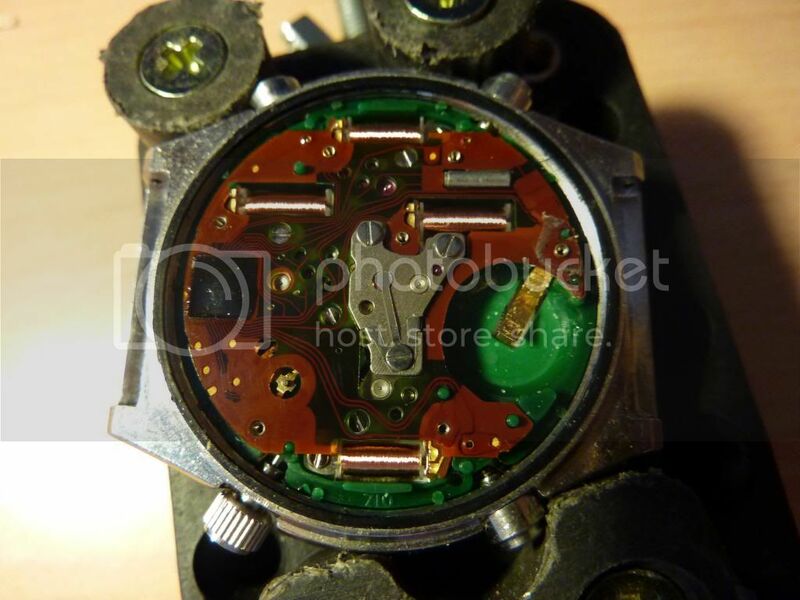 At the weekend I dissassembled a Seiko 7546 movement that had suffered fairly major battery leakage. I don't think I would have got it back together if not for the photos I took at every step of the strip down. There is of course nothing preventing you eliminating the above possibilities in the interim, Mark. By swapping the current good 1/10s coil for the potentially duff 30 minute counting coil and see if it makes a difference. Well, after weeks of putting this off, I finally sat down and did it today. Cousins failed to deliver the coil they had on backorder, as it became obsolete instead - so I wasn't holding much hope fo solving all my problems this morning. However, I'm pleased to say we're back up and running 100%! Here's the photo guide for posterity... sorry about the lighting, there's not enough natural light on my desk to avoid having a nasty lamp. In we go then - and the initial impressions are that it's nice and clean, although there's a bit of residue from an old battery in the terminal area..
Down through the spacer block, and all the insides are very clean with nothing obviously wrong... so it's coil change time on the one I DO have from Cousins (really sorry about the lighting in this one!!). Put the whole thing together again, ensuring the screws were all really tight, and hey presto, we're 100% operational! A £46 watch brought back to life completely - thanks for all your good advice folks, couldn't have done it without you! Well done, for persevering, Mark ! Told you it wasn't exactly 'brain surgery' - even for someone with 'fat fingers'.